alaTest on kerännyt ja analysoinut 3145 arvostelut lehdistä ja verkkosivustoilta. Keskimääräisesti, käyttäjät antavat tälle tuotteelle arvosanaksi 87/100. 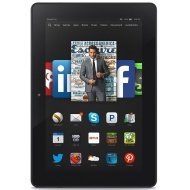 Amazon's latest Kindle Fire brings a lot of welcome upgrades and is sure to be a big seller this holiday season. Amazon's 7-inch Kindle Fire HDX is the simplest high-quality small-screen tablet you can buy, and ease of use doesn't come at the cost of performance. Sharp screen. Fast processor. Extremely easy to use. Amazing live tech support. Short battery life. Interface is very geared to buying things from Amazon. Editor's note (September 18, 2014): Amazon has introduced a new budget-friendly 7-inch tablet in the Kindle Fire HD 7. Armed with a powerful processor and Amazon's exhaustive content library, the Kindle Fire HDX delivers incredible value for its price, especially for Amazon Prime members. With its fantastic screen, fast navigation and excellent multimedia performance, the Amazon Kindle Fire HDX 7 is a fantastic tablet that impresses in so many ways but fails in one big one: choice. The Amazon Kindle Fire HDX does a lot to make itself a competitive offering. The detail in the display and the power on offer, for the price, make the Fire HDX a compelling choice of 7-inch tablet. It also offers excellent speaker performance.